RALEIGH -- Governor Roy Cooper announced his pick for Secretary of Public Safety Thursday. Erik Hooks will direct law statewide law enforcement, as well as oversee emergency management, juvenile justice, and the corrections divisions. 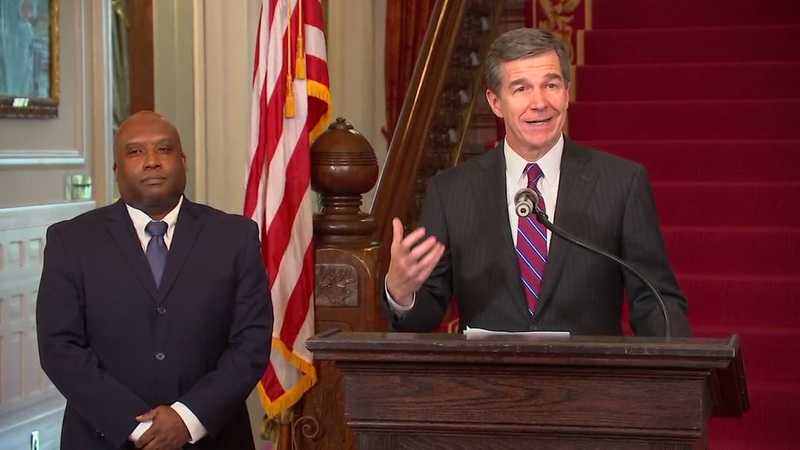 "He has the utmost integrity and determination to keep the people of our state safe," Cooper said. "North Carolina can depend on him to bring hard work and dedication to the mission of public safety." "I do thank Governor Cooper for this opportunity. I want to work hard to make sure we do have strong law enforcement in the state. And we also want to start bridging some more gaps between law enforcement and the community. And so I'm looking forward to taking on those challenges and I thank you for this opportunity," said Hooks. Hooks has long experience in North Carolina law enforcement. He began as an SBI special agent in 1989 and rose to Assistant Director over the Professional Standards division by 2014. Most recently, he oversaw the Threat Assessment and State Asset Investigations Unit and in the Inspections and Compliance Unit. "There were a lot of people who were interested in this position. I believe Erik has the ability to work with law enforcement all across North Carolina. But he also has an understanding of people in our community; the wants and needs there. I think we definitely have work to do to repair some of the trust issues that exist in some of our communities of color and law enforcement. I think Erik will certainly be leading the way in that effort," said Governor Cooper. Hooks holds a bachelor's degree in political science with a concentration in criminal justice as well as a master's degree in organizational management and research from North Carolina State University.